On Thursday, Catalan political parties are planning to hold a plenary session in the regional parliament to discuss a response to Madrid’s threats to invoke Article 155 of Spain’s 1978 Constitution, which would impose central government control on Catalonia. The debate of the Catalan political elite, initiated by the Candidatura de Unidad Popular (CPU) and Junts pel Sí (JxSi) parties, will take place a day before the Spanish Senate is expected to pass Article 155, which will remove Catalan leader Carles Puigdemont from office and suspend the powers of the regional institutions. 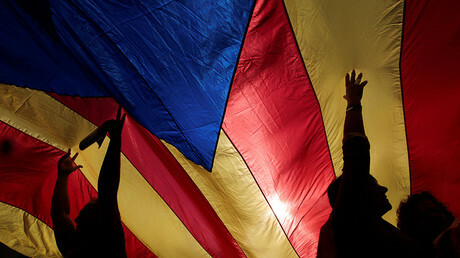 Speaking out Monday against plans to impose the central government’s rule on Catalonia, Lluis Corominas, president of JxSi, has accused Spain of “acting like a dictatorship.” To keep Catalonia's independence dreams alive, Corominas said a potential legal appeal against Article 155 would be discussed during the Catalonia’s parliament plenary session Thursday. The JxSi leader accused the main Spanish political parties, the centrist Spanish Socialist Workers' Party (PSOE) and the right-wing People's Party (PP), who called for the implementation of Article 155, of acting like the government of Francisco Franco, which from 1939 until 1975 suppressed Catalonia’s autonomy. “The PP government... is acting like the most extreme far-right party that has ever existed in this country. They are promoting the hatred towards Catalonia. Both sides, PP and PSOE,” the politician said. The decision to invoke Article 155 to restore order and reassert central government’s control over Catalonia was announced by Spanish Prime Minister Mariano Rajoy on Saturday. Madrid maintains that the Catalonia’s independence vote was illegal and void, and hopes to reshuffle the political elite in a snap regional election. Before Spanish lawmakers approve this course of action, 27 senators were tasked with studying the consequences of the imposition of such a constitutional order. Puigdemont has been invited to defend his government’s actions in wake of the October 1 referendum in front of the commission. The Catalan leader could face as much as 30 years in prison if Article 155 is introduced. Madrid’s decision immediately provoked a wave of outrage in the region, prompting hundreds of thousands of people to take to the streets to voice their discontent with the central government’s move. 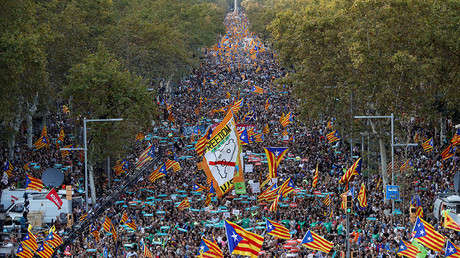 As the region remains in legal limbo amid indy standoff between Barcelona and Madrid, the socialist pro-independence CUP party called for “mass civil disobedience” on Wednesday against what the party called “the greatest aggression against the civil, individual and collective rights of the Catalan people.” Students also plan to hold mass rallies Thursday. Earlier Monday, Catalonia’s Foreign Affairs spokesman told BBC Radio that regional authorities and institutions will never surrender sovereignty to Madrid.